Catrina Sings is an all ages, bilingual puppet show about the Calaca Catrina (Skeleton). Catrina is the main tourist attraction of the restaurant / cantina “Los Remedios”. In an interview conducted by the waiter Gonzales, Catrina reveals in an entertaining way her secrets and show to us a different way of seeing death. Each show is followed by a free make & take activity. Wear your spookiest costume & be ready for some trick or treating fun! 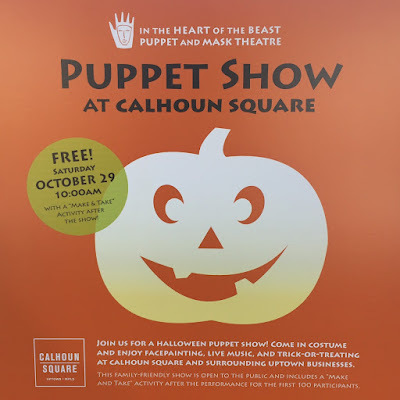 Catrina Sings will be performed FREE at Calhoun Square on Saturday, Oct. 29th, at 10am & Noon.